I was wracking my brain yesterday trying to come up with a post for today and I suddenly remembered that we haven’t talked about food for a while. I’ve tried two new recipes in the last week and they were good enough to share. So I’m sharing. The first is a summer salad that I made for last Saturday’s excursion to the alpaca farm. Sharon and I have a pretty sweet deal when it comes to outings like this. She drives. I bring lunch. I wanted to bring a salad but not a potato or pasta salad. I searched through Tastespotting and I found this August Garden Salad. I don’t have pictures of the one I made but it looked pretty much just like that one. I used 4 ears of corn, one can of beans, some grape tomatoes and a green pepper. I used some gorgonzola cheese instead of goat cheese because I think goat cheese is pretty disgusting. For the dressing I followed the recipe exactly. It made quite a bit and I shared with Kim and Manise and they both loved it, too. 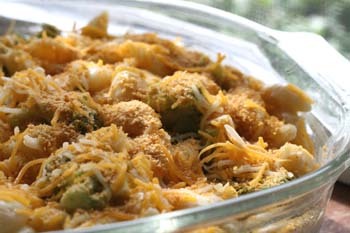 The other recipe is from Real Simple and it’s for Cheesy Baked Shells and Broccoli. I found this one on Dine and Dish and that’s another great food blog, if you’re a food blog reader. Anyway, I changed this recipe a little bit by using fresh broccoli, which I steamed while cooking the pasta, and I used some half ‘n half instead of milk because I had it. Oh, and for the cheese I used a combination of cheddar and monterey jack. I made it ahead of time and stuck it in the fridge so I had to actually bake it for a bit rather than just sticking it under the broiler. For the topping I used some more of the cheese blend along with corn flake crumbs because we love a crunchy topping around here. I served it with some baked salmon and it was delicious. It’s really just a variation on mac ‘n cheese but that’s fine by me. I enjoy trying new recipes and I do enjoy cooking but this weekend will be for eating out. Tonight we’re going to the Greek Festival — lamb, dolmathes, loukamathes!! — Friday night we’re going to the Scallop Festival — fried scallops and clam chowder! — and Sunday we’ll be dining at my favorite restaurant to celebrate my birthday. It’s going to be a real challenge to not gain any weight this weekend. Thanks for the links! Lucky duck with all those festivals. Especially the Greek one tonight! Hot dolmathes with avgolemono sauce (egg lemon sauce) is my favorite. And galactobouriko too! Have a super time. An early happy Birthday to you! OK, it’s not even 6:00 a.m. and I’m starving!! Yum, and yum!! You’re inspiring me to think about cooking – I’ve been off my game for several weeks. Good grief – I think you’ll be victorious if you can escape without gaining 10# this weekend! All that food sounds fabulous! Is it too early to start dinner? That looks so good. That corn salad was scrumptious….and here I thought I wouldn’t like it! Our Greek festival had lines so long we never did get any good food. Have a super birthday weekend!!!! Sounds like a fabulous weekend! Live it up, and dance the night away. Burns calories, don’t you know. Weight…..Schmeight……Enjoy and Happy B-day!! Men love curves!! And me sitting here with a Pop Tart! Enjoy it all – food eaten with good friends never adds weight! A birthday weekend only comes once a year…enjoy yourself and splurge! What a beautifully designed blog! I love it! Thanks for mentioning my site. The scallop festival sounds wonderful. Enjoy! Oh man! I want to hang with you this weekend! Do you realize I haven’t eaten Mexican since JUNE?!?! (I know you’re not eating Mexican, but that’s my indulgence food, so that’s my point of reference). *sigh* Have fun and happy early birthday! Our Greek festival was 2 weeks ago. Delicious! I can’t stay away from the pastries and Greek coffee. Happy birthday! I hope you have a fantastic celebration. Today is S’s birthday and we’re taking him out for dinner, too. I WISH we had a seafood festival…but it would no doubt be for Mountain Oysters. have a GREAT time! and happy b’day in advance! I’m so glad you’ve got yummy plans in place for your birthday weekend. Yum. That broccoli dish sounds great. Happy early birthday. Treat yourself really well. i’m with jess — not all goat cheese is disgusting. sounds like a great birthday weekend! I looooove scallops. Let me know how the festival is. I might have to put it on my calendar for next year. Happy Birthday! Eh, don’t worry about the extra food, it all sounds delicious. Just take a more vigorous walk, or some other more vigorous activity (ahem). Happy birthday, and thanks for the recipe links! Happy almost birthday and thanks for sharing the cool food links. I’m making this pasta tonight!